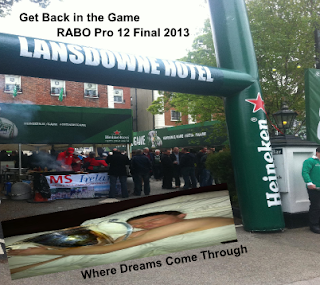 This being the last week of the domestic season, mind games between the rival New Zealand coaches, desperate to capture the Rabo Direct Pro 12 title, go up a notch. For Joe Schmidt it’s about leaving Leinster without the stain of three consecutive runner-up finishes in league finals. That would represent the only black mark in an otherwise phenomenal tenure. For Mark Anscombe it’s about backing up Ulster’s perfect start to a campaign, which faltered during the illogical international window and was almost ruined by a chronically overcrowded infirmary. This week his only concern is All Black tighthead prop John Afoa’s hamstring. Leinster also refuse to rule Seán O’Brien out of contention, despite a knee injury that prompted British and Irish Lions coach Warren Gatland to say on Monday his club season was over. Gatland went so far as to state O’Brien would be doing well to be fit for the Queensland Reds game on June 8th. And that he would be in Lions camp henceforth. With nothing definitive conjecture reigns. Afoa is expected to play, O’Brien is not. Either that’s the case or Gatland was telling fibs. But why would he? All told, it left a bad taste in the mouth. Chris Henry is expected to recover from a knee strain/knock to start Saturday but Luke Marshall and Craig Gilroy have been put on ice due to a triple-concussion and a groin strain respectively. Expect Afoa to be added to the starting XV that beat the Scarlets 28-17 on May 10th, with Declan Fitzpatrick making way. Iain Henderson will probably be benched as Anscombe goes with Robbie Diack on the blindside and Dan Tuohy partnering Johann Muller in the secondrow. Ulster’s impact options look inferior to Leinster’s, although Henderson and scrumhalf Paul Marshall can arrive if more urgency is demanded. Brian O’Driscoll will return after recovering from a back spasm. On the flip side, Anscombe’s men will use an even fresher open wound. Their comprehensive Heineken Cup quarter-final defeat to Saracens in Twickenham on April 6th stalled any talk of Ulster progress. They didn’t make any, but there were plenty of excuses. Muller tore his bicep in the opening minutes, Afoa had just come off a long haul flight, Marshall was knocked out for the third time in a month and Tommy Bowe wasn’t fit enough to start.